A light tent, also commonly known as a light shed, is used when photographing small items such as jewelry or small electronics. 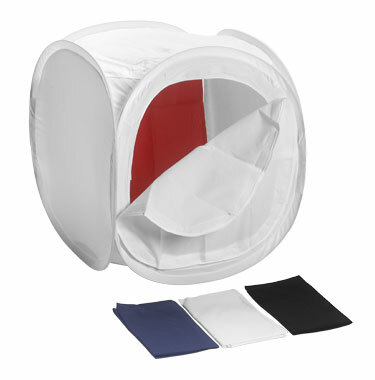 The tent is made out of a translucent nylon material and most come with backgrounds that attach to the inside. The purpose? To diffuse light evenly around the subject, soften the light, and reduce shadows. When using a light tent, choose your attached background carefully. The biggest mistake is choosing a background that will blend into the subject. Subjects that are reflective by nature, though, will need a surface that is similar in color. For example, if you're photographing a vase with a black glaze, a white background will create a white reflection. Instead, choose a darker color surface to create a less noticeable reflection. Lighting around the tent is just as important. Use at least two light sources –add a third to the front if you still see shadows. Daylight balanced fluorescent bulbs produce the most natural lighting. The lights should be set at the same level as the subject. You will need stabilization to ensure the best shot, so utilize carbon fiber tripods to reduce the chances of blur in the photograph. When you're ready to shoot, place the camera in the small opening of the shed. Light sheds are part of the vast selection of photography lighting equipment offered at SuperDigitalCity.com. Save 5% off your next order, through Friday the 10th, by using the coupon code LightShed5.